I would like to tell you about the biggest lie in book publishing. It appears in the biographies and social media profiles of almost every working "author" today. It's the word "best seller." This isn't about how The New York Times list is biased (though it is). This isn't about how authors buy their way onto various national best-seller lists by buying their own books in bulk (though they do). No, this is about the far more insidious title of "Amazon Bestseller" -- and how it's complete and utter nonsense. Here's what happened in the book industry over the last few years: As Amazon has become the big dog in the book world, the "Amazon Bestseller" status has come to be synonymous with being an actual bestseller. This is not true, and I can prove it. Two weeks ago, I put up a fake book on Amazon. 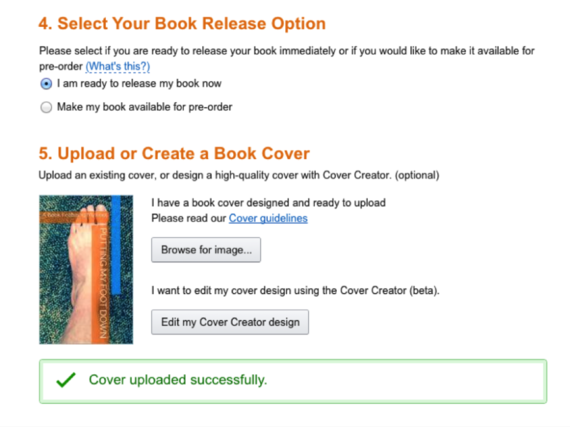 I took a photo of my foot, uploaded to Amazon, and in a matter of hours, had achieved "No. 1 Best Seller" status, complete with the orange banner and everything. How many copies did I need to sell be able to call up my mother and celebrate my newfound authorial achievements? Three. Yes, a total of three copies to become a best-selling author. And I bought two of those copies myself! The reason people aspire to call themselves "bestselling author" is because it dramatically increases your credibility and "personal brand." It can establish you as a thought leader. You're able to show that you not only wrote a book, but that the market has judged it to be better than other books out there. It's a status symbol, one of that cashes in on the prestige of one of man's oldest past-times. At last, I had acquired this coveted title for myself. I'm a partner at a marketing company called Brass Check. Over the years, we've helped launch 30 legitimate New York Times best sellers (including several at the sought-after No. 1 spot). My company has helped sell over five million books and advised or managed book launches with every major publishing house, including Amazon. We have important rules at my company about the projects we take on. We don't work with authors whose books we wouldn't read ourselves, and we don't guarantee best-seller status. We say no to more work than we say yes to, but these principles help us avoid the gimmicky, one-hit-wonders who aren't looking to write great books but instead are looking to trick people into thinking they have. But it's begun to feel a bit like a losing battle. Because those authors are everywhere these days. The title of my fake book was "Putting My Foot Down" for a reason: I've become utterly exhausted with phony "authors" and the scam artists and charlatans who conspire with these folks-the cottage industry that has built up around them, selling courses, instructions and hacks. A quick Google search returns dozens of "bestselling books," courses, packages, schools, secrets, summits, and webinars teaching you how to become a "bestselling author". Hell, this guy even promises to show you how to be a bestselling author "Even if You Have No Book Ideas, Writing Skills, or Any Clue Where To Start" in a "5 Phase Formula." Heart Centered Media will give you "Guaranteed Bestseller Status" for just "3 payments of $1,333," although they let you know "Book Sales are NOT Guaranteed." Denise Cassino promises that with her services, "You'll forever after be a 'Bestselling Author!' a tag that will open doors otherwise closed to you"...for just $3250. Jesse Krieger over at "Bestseller Campaign Blueprint" encourages you to "Imagine looking on Amazon and seeing...Your Book on the Best-Seller Lists Next to Your Author Heroes" and lets you know he can deliver that dream for just $997. Peggy McColl has "Launched Perhaps MORE Bestsellers Than ANY Other" and will teach you how for only $2,497. It used to be a real mark of distinction to hit the best-seller lists-because there were fewer lists and fewer authors (and before ebooks, pricing across books was pretty universal as well). The New York Times list has been the most prestigious, published in one form or another since 1931. By 1942, a national list made its debut, compiled according to "reports from leading booksellers in 22 cities." By the mid-2000s, over 4,000 bookstores were polled each week to determine who deserved to be on the list. The Wall Street Journal list, which has been around since 2009, is based on Nielsen Bookscan and tends to focus on a smaller number of categories. The USA Today list is also a prestigious but more of a catch-all list. Any industry person can tell you these lists have their problems. There's a barely concealed editorial bias. Bookscan, the database that tabulates book sales, inexplicably doesn't include Amazon's ebook sales. There's even the possibility of manipulation, as outlined in a 2013 Wall Street Journal article called "The Mystery of the Book Sales Spike." Still, they remain relatively hard to crack. In most cases, your book not only has to be good enough for a legitimate publisher to publish it, but you have to outsell all the other books out there, past and present, even if you're paying for it out of your pocket. We've had clients sell close to 10,000 copies in a single week and miss landing on these charts. Because of the high bar, the term "bestselling author" was a term with some meaning. It was seen as something that was earned through a lot of hard work. But today, that designation has changed -- for the worse. It's like when you see a food described as "natural." The FDA doesn't actually regulate that term, so it's basically meaningless. It's about time that readers -- and the media, which breathlessly repeats the best-selling claims of these authors -- wised up. 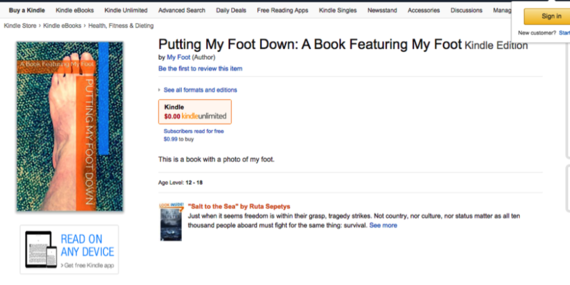 So let me show you exactly how I became a became a #1 Amazon bestseller for $3 and a photo of my foot in less than five minutes (with screenshots and proof). Hopefully, as my partner Ryan has put it, once you understand how the sausage is made, you won't want to eat it any more. 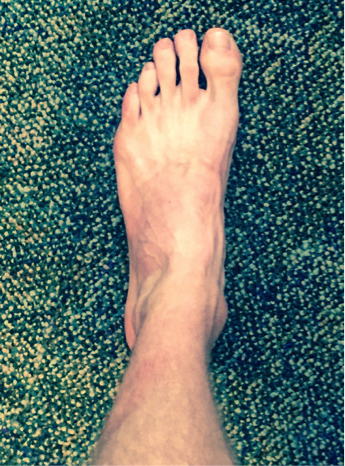 I didn't feel like writing a book so I instead just took a photo of my foot. 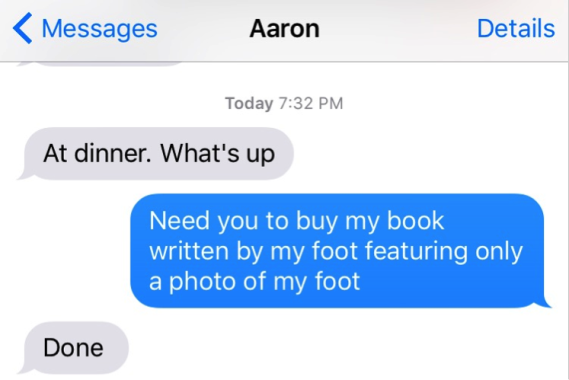 I called the book "Putting My Foot Down" and included one page with, you guessed it, a photo of my foot. They say picking a title is the hardest part of writing a book. Don't I know it! 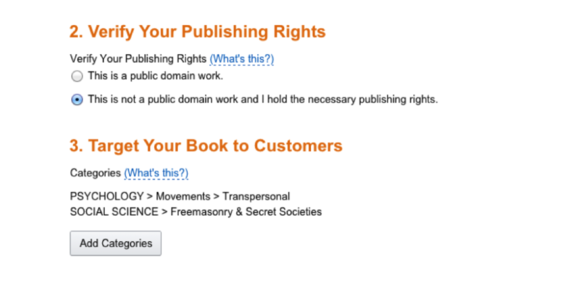 2) When you publish on Amazon, Amazon allows YOU to choose the category your book tracks in. 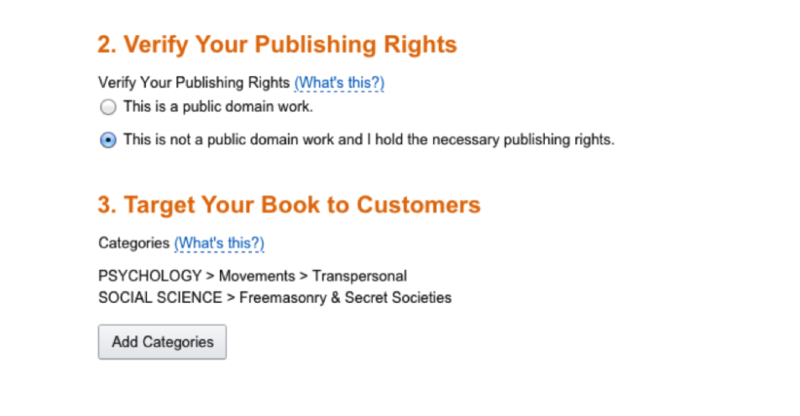 3) You can set the price of your book, down to 0.99. 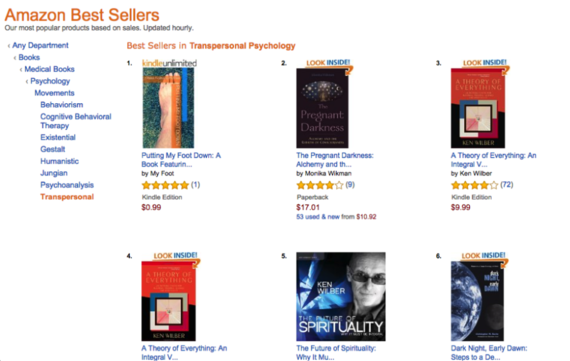 I decided my foot was worthy of the "Transpersonal" category under psychology books and "Freemasonry and Secret Societies" category under social sciences books. I've always wanted to have an affiliation with the Freemasons. 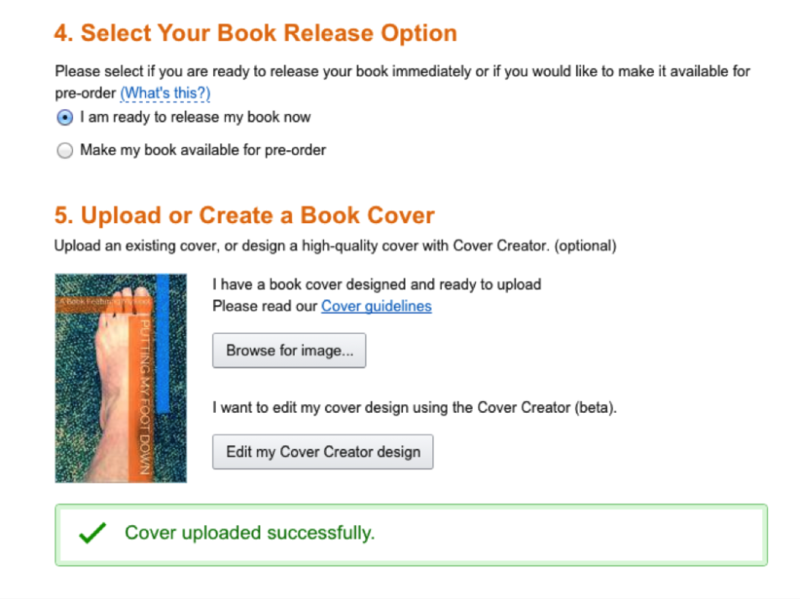 Amazon features a handy "Cover Creator" that will lay text over any image and create your cover in a matter of seconds. I chose my foot for the image. The waiting is the worst part of the process. What if Amazon rejected my foot? Just a few short hours later, another book is added to Amazon's extraordinary catalog. One small step for me... One giant leap for the digital world. The time invested in this promotion could have been even shorter if Nick had not asked so many nettlesome questions. Burst onto the scene with three copies sold in the first few hours. Look at that hockey stick growth! Not just one list either. 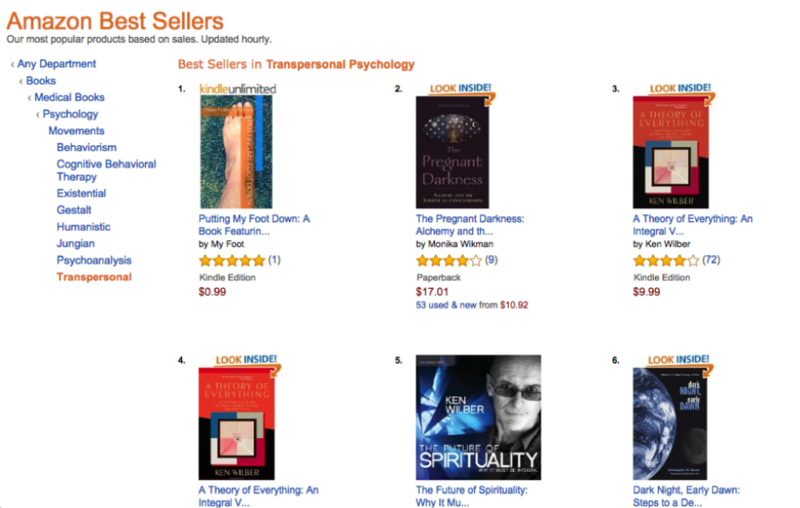 The book was so popular it also hit #2 and #3 in the "Freemasonry" category. Leading the pack. Sorry Monika and Ken. Gone are the days of having to be selected to put out a book. Gone are the days of having to go to a bookstore to see what is available. Now you can check online, with real time reviews, AND, real time "bestseller" rankings. It's unsurprising that as the barriers to entry for the book business went down, so did the quality of the books being produced. These days, over one million books are published each year, with at least half of these self-published. So it's almost obvious that, given the volume, you could game your way to the top of a category with very few sales. And yet, in spite of the fact that it's as easy as I've shown to become an Amazon best-seller, those same people get to cash in on the goodwill and prestige build up in the title "bestselling author." I didn't write this to make my foot famous. I wrote this post because I'm tired of vanity titles and success without quality. I also wanted to show how simple it is to call yourself a best-selling author, in the hopes that people buying books become more discerning customers. 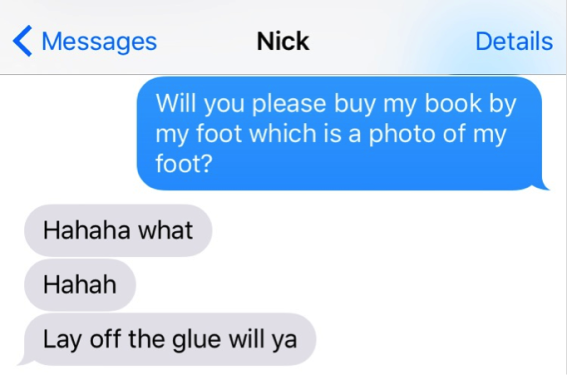 Remember, if I can make my foot a "bestselling author" for under three dollars and a few minutes of work, you should take any person presenting themselves as such with a grain of salt. For the authors: I hope my story illustrates that the best marketing tactic you can use for a book is to write a great book that actually sells over the long term. It's easy to be seduced by best-seller lists, sales numbers, speaking fees, and all the ephemera in this industry. Don't let all of that make you lose sight of the importance of quality and authority in your work. Anyone can be a one-hit wonder; focus on crafting a book that will sell for decades. As for me and my foot, I'm awaiting a movie studio's call for the film rights and plugging away on the sequel. The working title is "Put the Right Foot Forward." New York Times list, here we come. 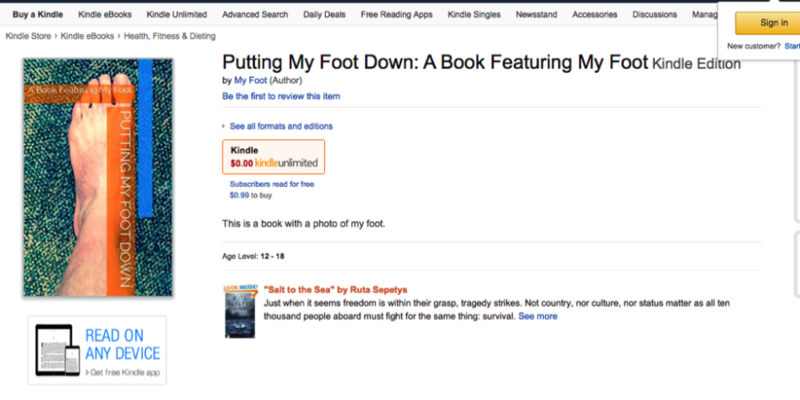 Author's update: I've written a revised and expanded version of Putting my Foot Down, which you can find here. Brent Underwood is the No. 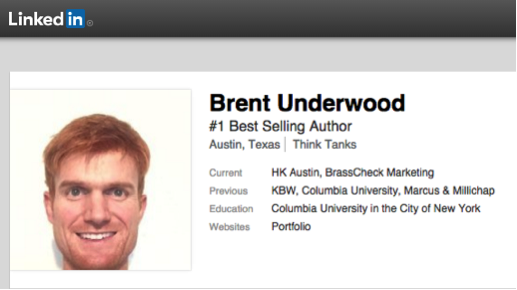 1 best-selling author of "Putting My Foot Down" and a partner at Brass Check.